This Skinny Chopped Chicken Taco Salad will keep everyone around your dinner table happy. Bursting with the flavours of the Southwest, you can easily customize it to include your family’s favourite ingredients. Do you have picky eaters in your family? Do you ever wonder what to serve your guests when you don’t know their likes or dislikes? 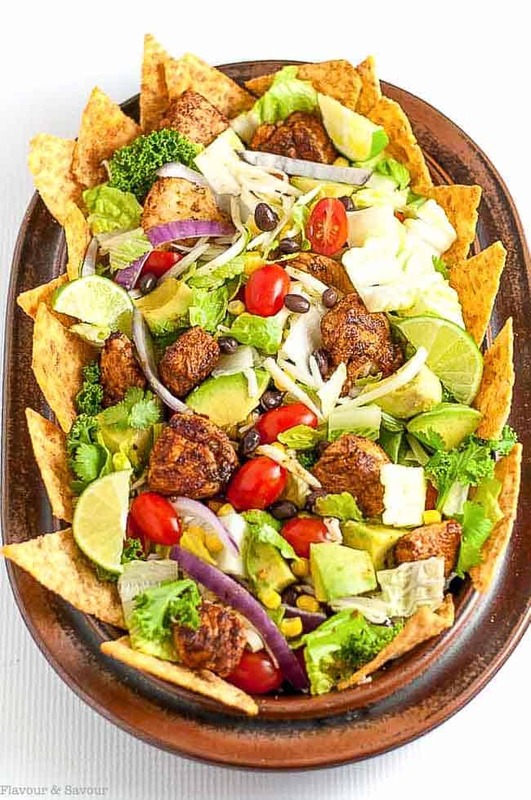 Skinny Chopped Chicken Taco Salad to the rescue! This meal solves all my problems when I’m choosing what to make for a healthy dinner. 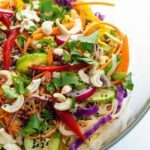 With allergies, food sensitivities and special diets, it can sometimes be difficult to serve a one-size-fits-all dinner. 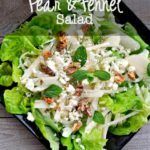 Letting your guests or family members create their own salad has been my lifesaver for this problem. I offer all the ingredients, either on a big platter or in separate serving dishes and invite my guests to dig in. I’ve done this before with this Family Style Greek Cobb Salad. It makes everyone feel comfortable and allows them to stick with their special diet. Start with a big bowl of chopped romaine, or add other greens as well. Offer taco-seasoned chicken, black beans, corn, red onion, avocado, tomatoes, and Monterey Jack cheese. Add different crisp vegetables like peppers and cucumbers, if you like. If you know of allergies ahead of time, you can also substitute a non-dairy cheese. Put out a bowl of rice chips as well as taco chips. Your vegetarian friends can skip the chicken, vegans can also skip the cheese. Offer cilantro and dressing on the side for those who choose to avoid it. 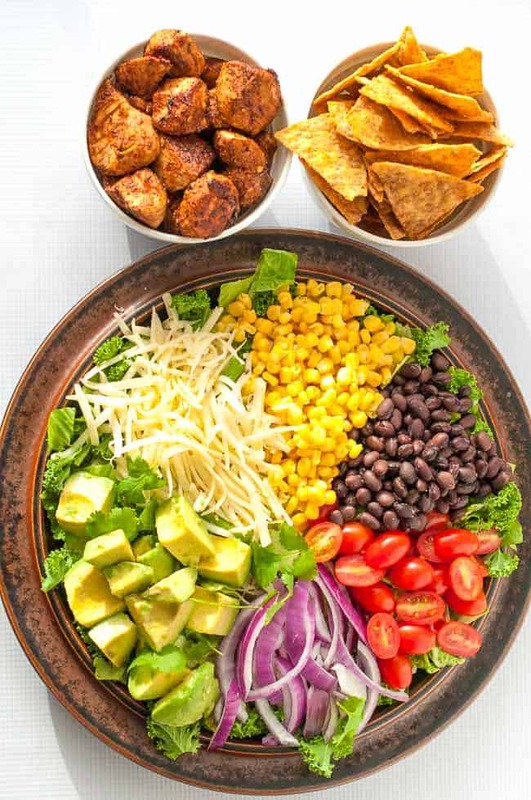 This healthy Skinny Chopped Chicken Taco Salad keeps everyone happy! Tossing the salad with a lime vinaigrette adds a ton of flavour while keeping it fresh and light. I mix up the vinaigrette first so the flavours can blend while I’m preparing the rest of the salad ingredients. I chop the chicken into bite-sized cubes, toss with a teaspoon or so of oil and season with my homemade Taco Seasoning Mix before browning it in a skillet. Once the chicken is cooked, I set it aside and prepare the other vegetables. 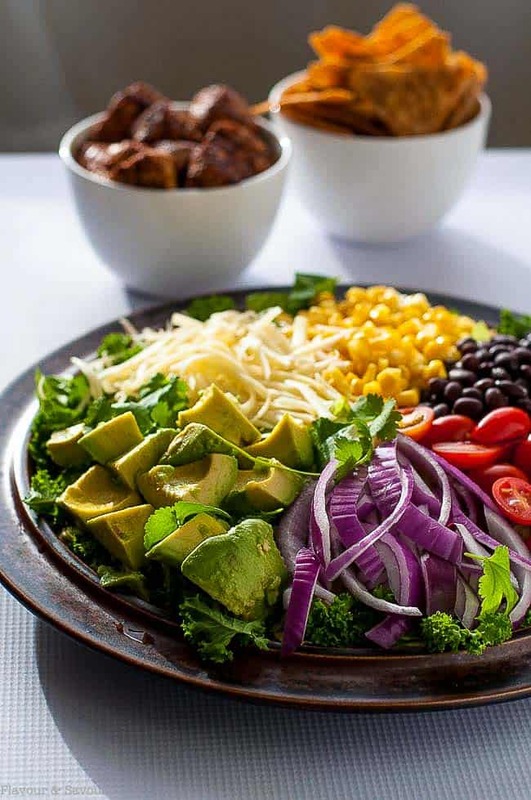 All the ingredients in this taco salad can be made in advance, giving me more time to spend with my friends, instead of rushing around in the kitchen. Kids can often be picky eaters as they’re learning about different textures and flavours. I’ve found that they love this taco flavour and like these easy Taco Chicken Wings or Strips and Taco Stuffed Peppers too. 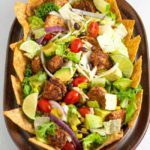 Next time you’re faced with the problem of satisfying everyone’s likes and dislikes, try this Skinny Chopped Chicken Taco Salad. 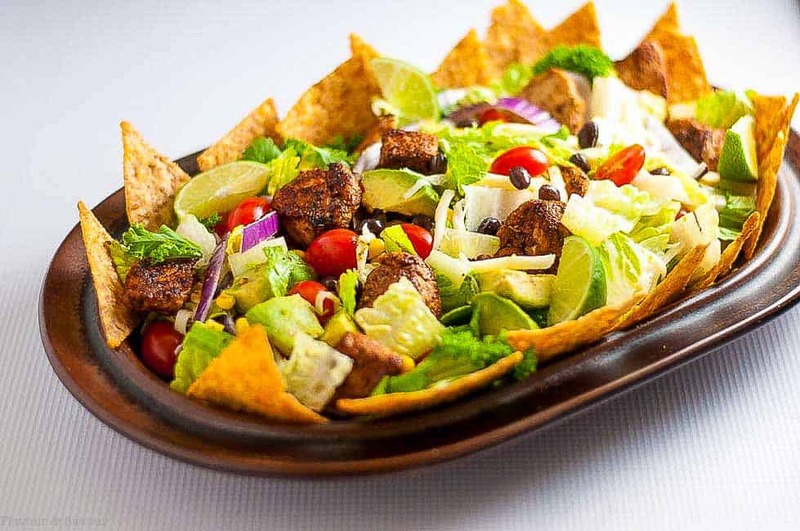 Keep even the pickiest eater happy with all the options provided in this recipe for Skinny Chopped Chicken Taco Salad. Easy to customize for your vegetarian or vegan friends. Toss chicken with oil, and then with taco seasoning mix. Heat oil in a skillet, add chicken and cook for 10 - 15 minutes turning to brown on all sides. Remove from heat and set aside. 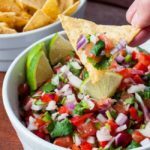 Combine all ingredients except taco chips in a large bowl. Add cooked chicken and toss salad with vinaigrette. 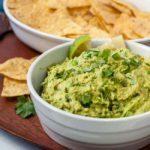 Serve with taco chips. Brilliant idea for tricky appetites and dietary needs. Yummy looking salad. Who doesn’t love tortilla chips? If corn, it’s a low fodmap option for sensitive digestive tracts. Thanks Jane! We love this one. Good to know that corn chips are okay on low fodmap diets.